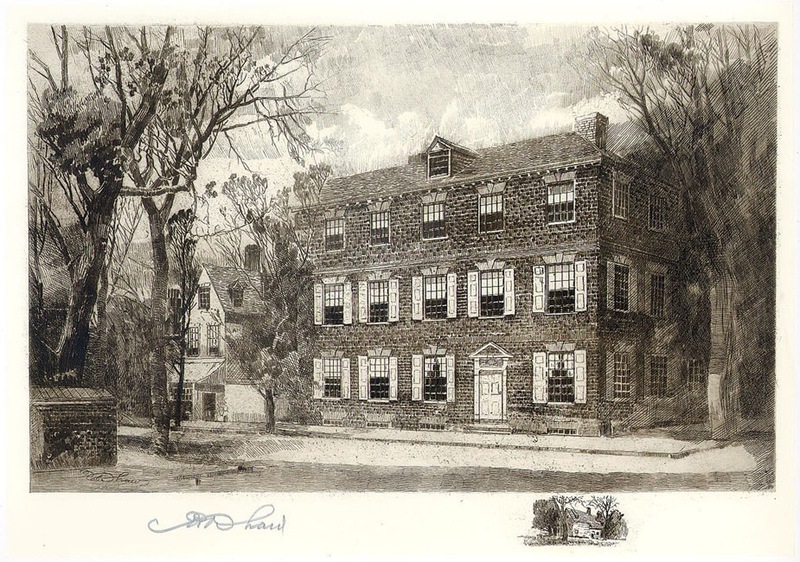 Illustration of the house owned by Jacob Graff, Jr. - on Market Street, in Philadelphia - where Thomas Jefferson wrote the Declaration of Independence in 1776. Jefferson rented the second floor. Later, the house was remodeled, making it almost unrecognizable from the time Jefferson used it. Illustration by Robert Shaw, c. 1906, online courtesy Library of Congress. While General Washington and his troops were fighting the war, the Second Continental Congress convened to formally manage affairs on the home front. It wasn't easy. The "federal" system of government was not yet created. Each colony had its own legislature; there was no centralized authority to govern what was not-yet a unified country. People disagreed about all kinds of things. By June of 1776, however, most of the representatives did agree on one important issue. The colonies needed to formally assert their freedom from George III. But ... how would they do it? On the 7th day of that month, Richard Henry Lee, a representative from Virginia, submitted a resolution to declare independence from Britain. Congress would delay a vote on the resolution for three weeks and would appoint a committee to prepare a formal document. Five men were chosen to write the draft: Thomas Jefferson (Virginia), Roger Sherman (Connecticut), Benjamin Franklin (Pennsylvania), Robert R. Livingston (New York) and John Adams (Massachusetts). Because of his recognized writing skills - exhibited in prior documents like the 1774 proposed instructions to congressional delegates - the man from Virginia would prepare the first draft. Needing a quiet place to think, Jefferson left his in-town lodgings and rented the second floor of a home at the outskirts of Philadelphia. Owned by Jacob Graff, a German bricklayer, the house - at the southwest corner of Market and Seventh Street - was a year old. A stable (with lots of bothersome horse flies) was located across the street. At the time Jefferson used it, the house was wide but very narrow. A later addition, doubling its size, made it almost unrecognizable, but the National Park Service rebuilt it - in 1975 - to its original appearance. Not knowing he would be assigned the task of writing a Declaration of Independence, Jefferson did not have his books with him. However, his memory of all he had studied before, his own draft of a potential Constitution for Virginia, plus his understanding of Virginia's Declaration of Rights (this is George Mason's first draft), would be enough. Jefferson penned the Declaration on a portable writing desk which he had designed and Benjamin Randolph, a Philadelphia cabinet maker, had built. The desk, one of America's treasures, survives. As the principal drafter of the colonies' declaration of freedom from Britain, Jefferson grappled with another fundamental question. Should his document mention slavery? Britain had not-yet abolished the slave trade, and its colonies were filled with Africans who had been kidnapped from their homes and sent across the ocean to foreign lands. Jefferson, himself, "owned" slaves - as did General Washington and many other colonial leaders. Thomas, then thirty-three years old, made a monumental decision. Not only would he mention slavery, he would write a scathing indictment against it. Let's take a look at the language which Congress ultimately cut from the original draft. Bos, Carole "THE DECLARATION HOUSE" AwesomeStories.com. Jul 01, 2008. Apr 23, 2019.